The introduction in August 1961 was very well planned and organised. Prototypes had been tested intensively between 1959 and 1961. 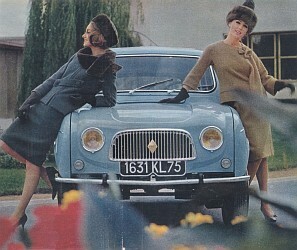 As early as March 1961 Renault organised a session with the dealers to prepare them, and get acquainted with the car. There was a press introduction in August in the Camargue. 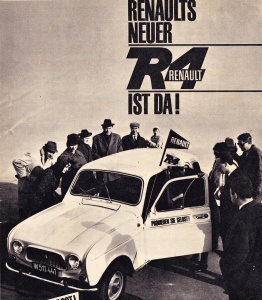 Finally, the R4 was introduced to the public during the Salons of Frankfurt and Paris. 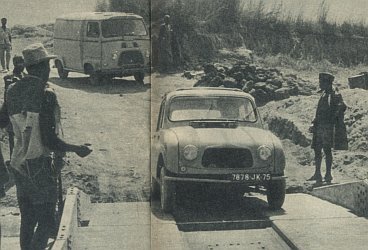 The public was encouraged to try out the new car by the 'Prenez le Volant' operation, in various countries. Note that a map showing many locations and photos from this period can be found here. Detailed information about this period can be found in the 'Album Renault 4' by Robert Séjourné, and publications by Renault Histoire, for instance 'Les essais de mise au point' by Louis Buty, who also produced diaries of the essays embellished with many photos. - 'deuxième série de confirmation' (37-59?). 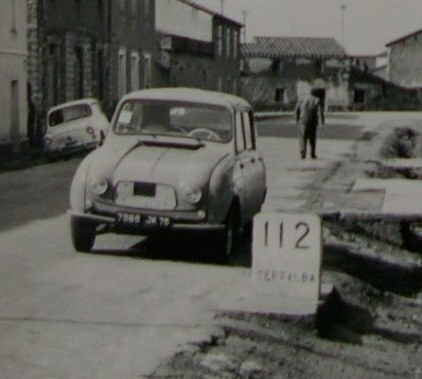 112 prototype no 12 pictured at the 112km sign of the SS131 between Oristano and Paulilatino..
.. and similarly along the SS126 in Terralba, March 13, 1960. 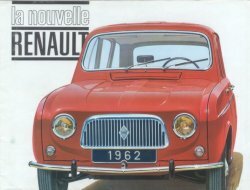 The first published drawing appeared in l'Auto-Journal ('Le journal de l'homme du XXe siècle') 193 (March 1st, 1958: 'Bombe Renault: la 3CV') and 194 (March 15, 1958: 'Tout sur la 3CV Renault'). 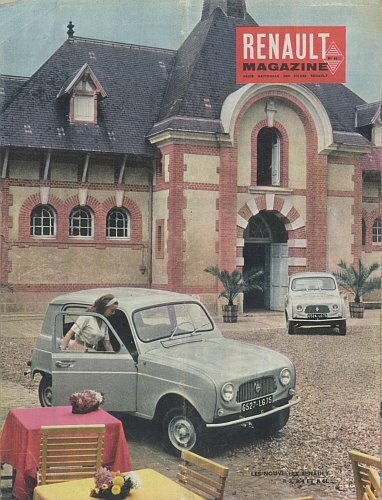 The same journal also published the first photos in numbers 193, and further 250 of July 14, 1960 ('Nouvelle 4CV Renault') and finally more photos in number 270 of April 20 1961. 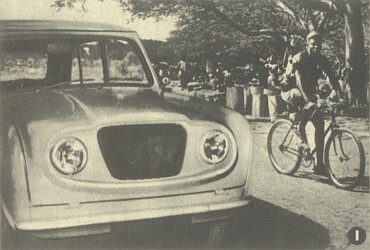 Five prototypes numbered 10 through 14 were built of the 'présérie de confirmation'. Number 10 was sent to the Renault test center at Lardy, and 11 to the 'Service Style'. The others were tested in places like Sardinia (nr 12, to test poor road conditions), Guinea and the Sahara of southern Algeria, (nr 13, extremely warm conditions) and Minnesota (nr 14, extreme cold). The first drawing, shown below, is still quite different from the final model. The prototypes shown on photos labeled 3 and 4 (in front of the Grand Mosque in Agadez, Niger) are already somewhat familiar, except for the strangely shaped bonnet and shape of the grille. Remarkable fact: these protos already have the central ribble that would be absent in the later pre-series. Maybe the ribble was absent on the pre-series to enable recognizing them from the series models? Note that all lack the grille logo - in order to prevent all-too-easy recognition? 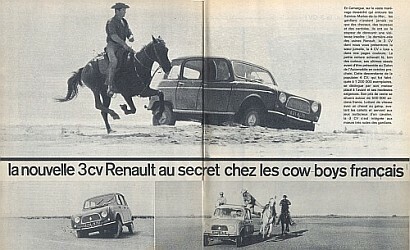 Renault of course tried to keep the development of the R4 a secret for as long as possible. A well known telegram from 1959 signed by 'Johnny' refers to the car in code language as 'Marie Chantal has joined her aunt', and the origin is censured in order to keep the test location a secret. 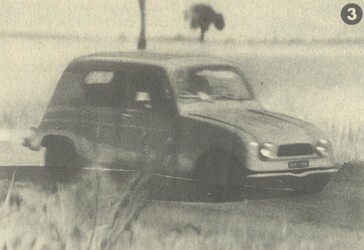 A number of photographs of prototypes were published in Renault Magazine 44 of September 1961. The photos below show that the prototypes, when not used, were well hidden during the testing in Guinea and Sardinia. 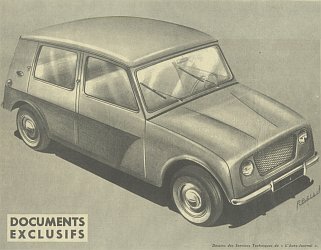 The deuxième série de confirmation, which became available somewhere around November 1960, looks very much like the series models that were produced from about August 1961 onward. The cars of this series, as well as those built during first few months of the production, had a flat bonnet without central ribble and a low fuelpipe entrance. The few surviving specimens are very much sought after nowadays. About 10 are currently known. 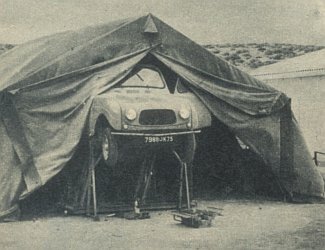 Shown below, photos published in Paris Match 616, of January 1961, illustrate the story of belgian rallye champion Paul Frère who ran into a prototype in In Guezzam, between Fort-Lamy and Tamanrasset, Algeria. The technicians he spoke to told him 'il s'agit', lui dirent-ils, 'de la future 3 CV Renault' ('it is about the future Renault 3CV'). 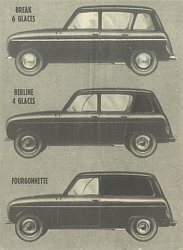 The three silhouettes show what l'Auto-Journal, in the same April 1961 issue, considered to be the three versions: break (4L), berline (3/4) and fourgonnette. Clearly, the Fourgonnette, that would be only be introduced in October at the Salon de Paris, wouldn't be quite what they expected. Protos 29 of the 'sé de confirmation' and 46 of the 'deuxiéme série de confirmation' were already fourgonnettes,l but has anyone ever seen photos of them? . 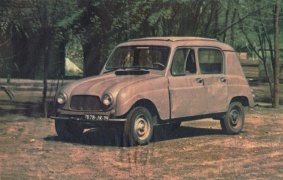 The last photo, from a September issue, shows a pre-series R4 that was used by l'Auto-Journal for a test. 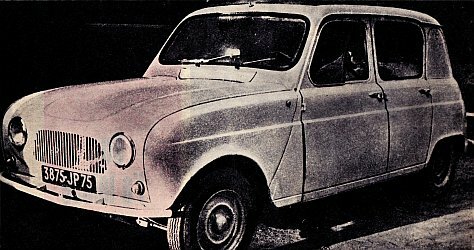 The first serie produced R4 were constructed on August 3rd 1961. 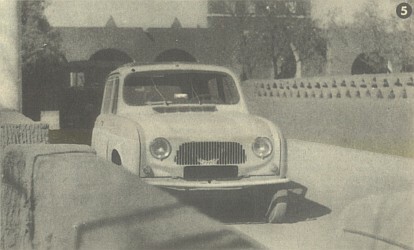 The first cars sold to the public from August onward had a flat bonnet and low fuelpipe entrance. They are very much sought after nowadays. Only about 8 are currently known to exist, only one having the low fuelpipe entrance. Silhouettes of the expected three versions (April 1961). 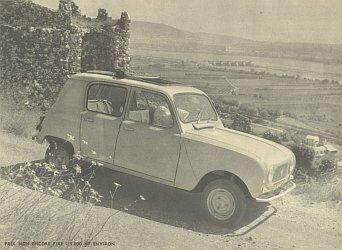 The Fourgonette is far off..
Open-roof pre-series R3 or R4 at Château de Rochemaure overlooking the Rhône (l'Auto-Journal, September 1961). Note the low fuel-pipe entrance. 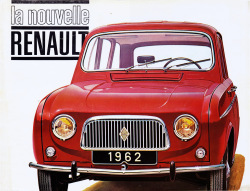 As the R4 was a wholly 'nouvelle voiture', the introduction was planned in detail - the first time in modern history a car would be introduced that elaborately. Therefore, those who would have to sell the car were carefully instructed. 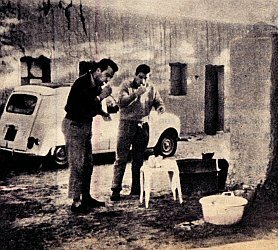 The introduction to 'les directeurs commerciaux des zones et le bureau de groupement des concessionaires' took place in March 1961 at the château Porgès de Rochefort en Yvelines, which was gaurde by policemen on foot and on motorbikes. A short documentary was made of the operation, which was named 'Opération Soraya'. It is in this documentary we hear for the first time the well known slogan 'pas de graissage, pas d'eau, juste un peu d'essence'. We see a couple of busloads of personnel arrive at a rather chique mansion in misty weather, showing badges saying 'Présentation confidentielle'. After kind words by the Régie EO's we see a lot of serious middle aged men in raincoats and suits - not really the blokes you'd expect to drive an R4 - apparently admiring and driving the new car. The prototypes 54, 55 and 56 use for Soraya were named 'les 112 de la Direction Générale'. In the documentary, a couple of cars are taken for a rough ride around. Surprisingly, at 10'42" in the Youtube clip we already clearly see a Super - due for introduction in October! 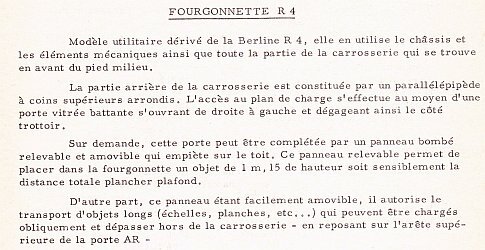 - a large leaflet (dépliant) (45.898, later replaced with 'nervure' 45.928; 45.930 is the left steering 'Remarkable'. - information about the new 'Credit DIAC'. Moreover, the booklet contained precise instructions on how to convince the potential customers. The prospectus was meant to give to everyone. 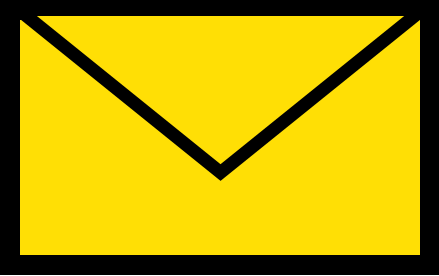 The small leaflet could easily be slipped into an envelope to be used for 'mail service', to a selected clientele. The large leaflet, finally was to be handed to all 'firm' prospects to push them make their decision. The letters also provided advice to the dealers: to add a leaflet, a quote or information on financing the new buy. In the letter to the 'clientele urbaine' emphasis was, apart from the technicalities, on the possibility to hold an entire family. In the one to the 'clientele rurale' one could read about its capacity to hold lots of stuff (the 5th door!) and the fact that its suspension makes it very suitable for the lesser roads. Dealers in Holland received a comparable piece of work listing arguments to be used for convincing potential customers, but without the above mentioned goodies. Furthermore, in September dealers received an 8 page issue of the top secret Renault Promotion 12 (shown here is the British or American version - without mention to the R3 of course). Inside, there was information about the fundamental principles of the renault technical doctrine (..), the 5 original features of the new Renault, and 'why and how we created the new Renault' (written by design and research manager M.F. Picard), and 'what you can tell your prospects'. As the Promotion contains quotes from l'Argus, Paris Jour, l'Équipe and other papers dating from the end of August, it must date from September, despite it being labeled August. 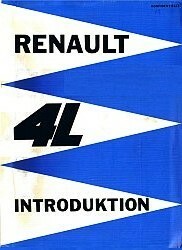 The 4L was officially introduced to the press between June 20th and August 26th 1961. Four or five days were spent in the Camargue in southern France. 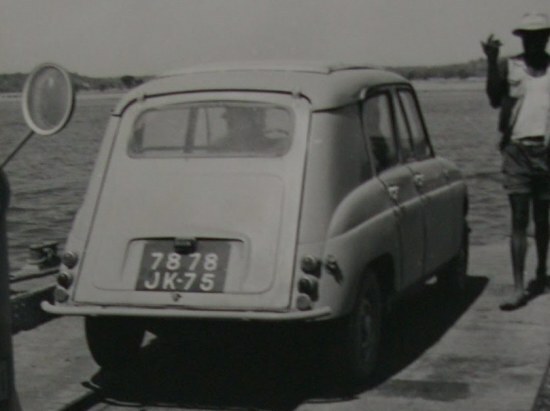 The Camargue was, at least by that time, a rough and sparsely populated area well known for the wild horses living there, bereft of all luxury - quite the spot for the introduction of the 4L, not? On the right picture we see some personnel taking care of the cars prior to unrevealing them. An extensive description of the press presentation can be found in Renault Magazine 44, showing photos taken in Le Grau-du-Roi, Aigues-Mortes, Saintes-Maries-de-la-Mer and around. For the occasion, another short movie was prepared: 'Ballade en Camargue' of which the soundtrack was published on EP (tip: buy this record, or the Argentian version 'Banda musical de la pelicula "Rodeo"', containing the same soundtrack). We see two cars in bleu île de France and rouge esterel driving around some rough terrain, as we will later learn on their way to accompany a couple of horsemen (probably the same guys that appeared in Paris Match 647 of September 1961 - rumour has it that the mannequins in the same Paris Match at first refused to pose with such an ugly car..). 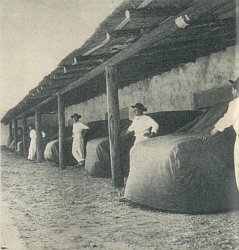 The blue car has an open roof from which a herd of cattle being traced by the cowboys is filmed. One of the animals is caught. In the end, we even see a donkey transported in the back of the red car! Finally, we see the drivers of the cars saying goodbye to donkey and cowboys, and perform some spectacular drifting to emphasize the perfect stability of the cars. Of course, the representatives of the press weren't sent home without some solid material to inform them how to write about the R4. The booklet is shown below. 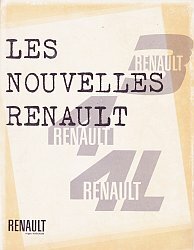 Its opening text reads 'At the next Paris Automobile Salon the Régie Renault will present its new models the R3, R4 and R4L which will replace the famous 4CV which has been built since 1947' (thereby surpassing the Frankfurt Salon..). 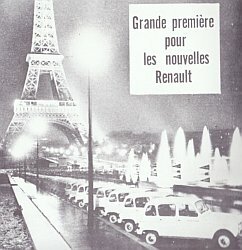 It elaborates on all technical advantages, performance, cost, reparation - and credit; the DIAC, 'Societé de Crédit affiliée à la Régie Renault', apparently presented a new credit formula. The same booklet was later extended with some extra loose pages introducing Super and Fourgonnette. The fourgonnette is described here as having 'the rear part of the body [..] constituted by a parallelepiped with rounded superior corners', the latter referring to the roof. Pretty accurate, huh? The Super, 'new model of the R4 spectrum, distinguishes itself of the R4L by its more refined equipment and slightly superior engine allowing a top speed of 110 km/hour'. 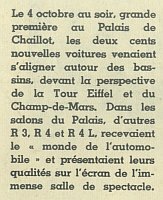 As proof that the 4L made an impressive first appearance, the first commentaries in the French press date from August 29 through August 31, according to Renault Promotion 12. Another peculiar leaflet is shown below. It looks like a newspaper and it shows the same pictures that are present in the dépliants. It is not sure what and for whom it was meant to be. Anyway the reference code 45913-07-03 places it a little while after the prospectus and dépliant. 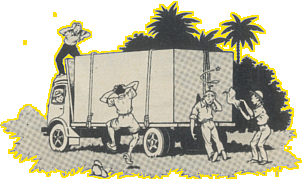 The picture on the flip side was used (and altered) often, as illustrated here in the Spot the Difference section. An alternative version, shown on the right, includes the price of the R3 in the lower right corner. The public introduction took place in September at the Salon de Frankfurt for the R3, R4 and R4L. Neither Super nor Fourgonnette were there yet; they would be introduced in October at the 48th Salon de Paris (although the Super was already visible in the Opération Soraya movie!). 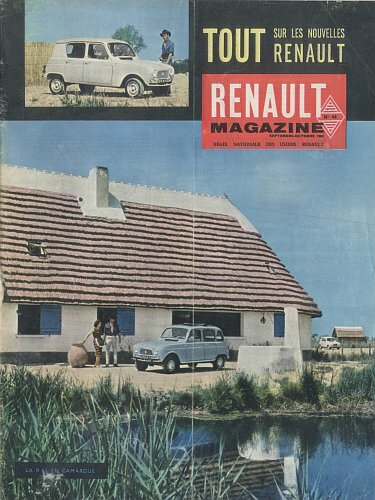 Around the same time, Renault Magazine 44 of September 1961 announced 'Les nouvelles Renault'. The commercialisation started on October 4th during the Salon de Paris. 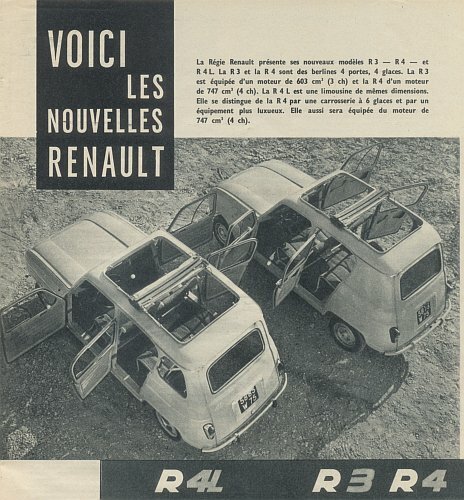 Back page of Renault Magazine 44 showing an R3 or R4 at Domaine de Pinceloup, Sonchamp. For the 'Prenez le volant' operation in Paris 200 white R4 were available for the duration of the Salon. 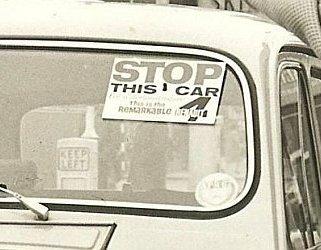 All were equipped with three blue, white and red flags (in France: 'essai libre', '4L Renault' and 'Renault'), and stickers on the front doors inviting the public to take the wheel. 60,000 people drove 440.000 kilometers in 10 days. Afterwards, the operation was continued in other parts of France until well in 1962. The same campaign was also ran in (at least) Belgium, the Netherlands (November), Germany, the United Kingdom (February 1962) and Austria ('Probieren Sie selbst", February and March 1962). 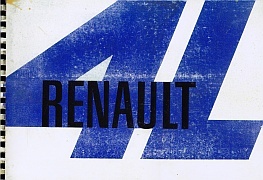 In Spain the R4 was only introduced in 1964, but the same flags were used ('El nuevo 4L Renault'). 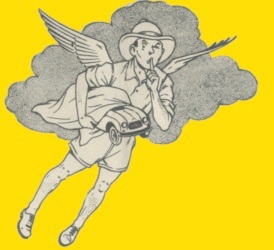 The name of the campaign was translated into 'Neem het stuur' (in flemish), 'Stuur Zelf' (in Dutch), 'Stop that car' (in English) or 'Stoppa bilen - kör dit Ni själv vill' (in Swedish - the last words can be translated as 'and drive where you want'). In all of those countries, a large number of white 4L were available for a free ('Essai libre') or guided tour. 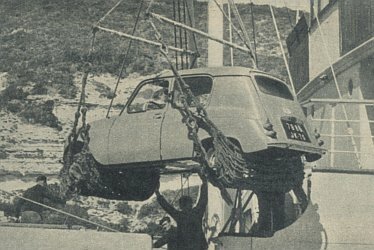 'El nuevo 4L Renault' in Spain, 1964. 'Probieren Sie selbst' in Austria, 1962. 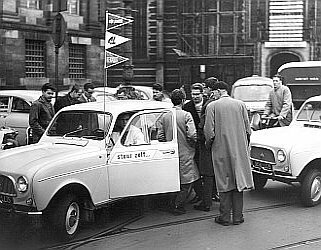 In 2011 Dutch Losange magazine published the story of a Dutch student who was one of a group of 70 that was hired by Renault to pick up the cars in Billancourt. They were to drive to and through the Netherlands for 10 days. During this period at least 5 cars crashed.. 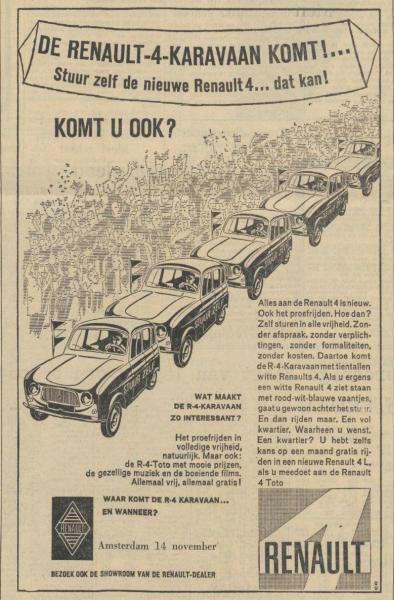 Nevertheless, the 'Renault 4 Convoy' was a huge success, maybe because it was advertised in the newspapers too ('The Renault 4 Convoy is coming - are you too? '), and there was a contest offering a month of free driving an R4 as prize (question: what is the highest number on the speedometer). - l'Auto-Journal 193, March 1 1958. 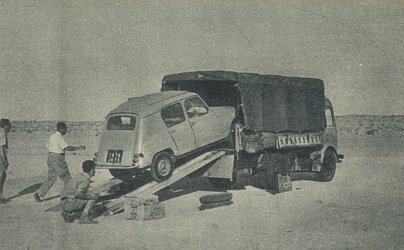 Bombe Renault: La 3CV. La Régie prépare une nouvelle voiture populaire 4 places. - l'Auto-Journal 194, March 15 1958. 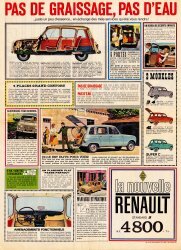 Tout sur la 3CV Renault. - l'Auto-Journal 250, July 14 1960. 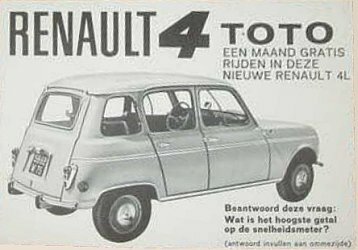 Nouvelle 4CV Renault. - Paris Match 616, January 28 1961. 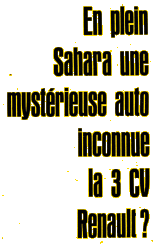 En plein Sahara une mystérieuse auto inconnue la 3CV Renault? - l'Auto-Journal 270, April 20 1961. La nouvelle 3-4CV Renault, rivale de la 3CV Citroën. - l'Équipe, June 20 1961. Officiel: La nouvelle Renault sera au salon de Paris. - l'Auto-Journal 280, September 2 1961. 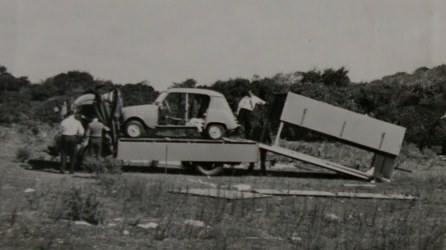 Premier banc d'essai de la nouvelle 3-4CV Renault. La rivale de la 2CV Citroën. - Paris Match 647, September 2 1961. 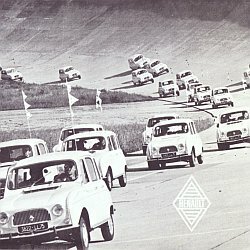 Sur la route, la 4L succède à la 4CV Renault. 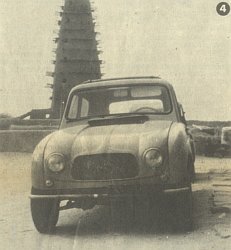 - l'Automobile 185, September 1961. Spécial pre-salon, 3-4CV Renault contre 2-3CV Citroën. - Autopista 266, February 2 1964. 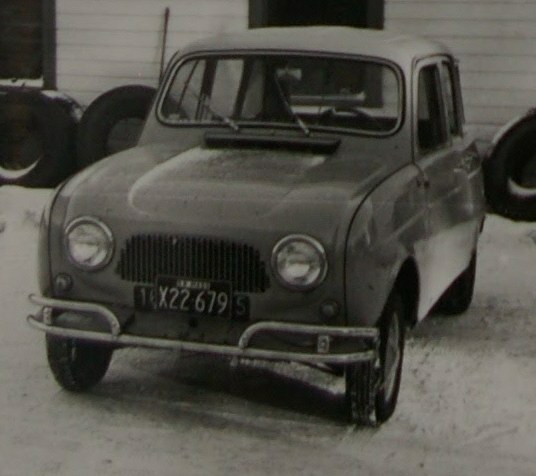 Salio el R. 4-L.
- Renault, August 1961. Special Renault Promotion 4 and 4L. - Renault Magazine 44, September 1961. Tout sur les nouvelles Renault. 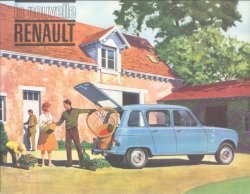 - Renault, 1961. Dossier concessionnaire. 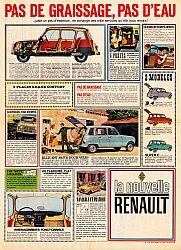 - Renault, 1961. Dossier presse (?). 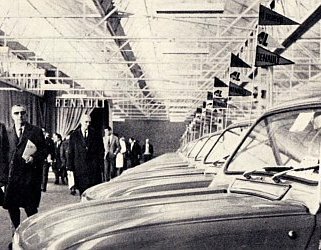 La Régie Renault au salon de l'automobile 1961. 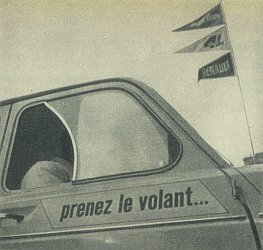 - Renault, 1961. Dossier presse (?). Les nouvelles Renault 3, 4, 4L. 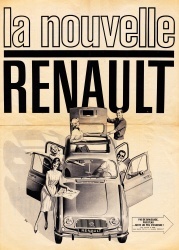 - Renault, 1961. Filme 'Opération Soraya'. 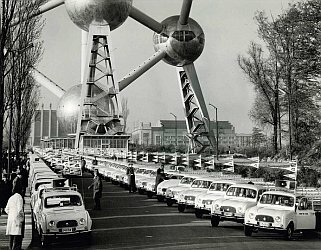 - Renault, 1961. Filme 'Ballade en Camargue'. - Losange Magazine 20, winter 2011. Stuur zelf. 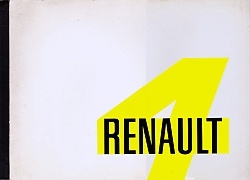 - Renault Histoire 02. les essais de mise au point 1958/1961, by Louis Buty.